Today we're starting a new Thursday weekly series on Jewish Humor Central. We've been posting a joke every Monday to start the week on a funny note. Now we're also adopting Thursday as a special day as we join the many blogs, Facebook, and Twitter posts that designate Thursday as Throwback Thursday. Throwback Thursday has become a weekly social media posting trend to let readers and viewers look back fondly on some of their favorite memories -- hence the "throwback" theme. At Jewish Humor Central, we'll be posting a nostalgic video clip from a very old TV show or movie that brings back happy memories. Today we're sharing an old episode of Groucho Marx's TV show You Bet Your Life. 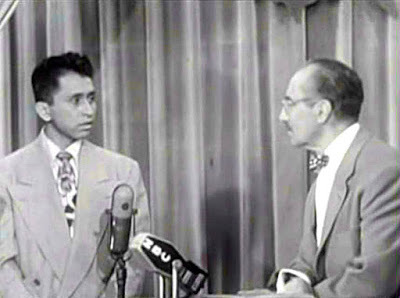 It's the classic episode in which Groucho meets Pedro Gonzalez Gonzalez, a Mexican character actor who made his first appearance as a contestant on the quiz show. The segment was so funny that Gonzalez Gonzalez was offered roles in movies and became best known for his appearances in a number of John Wayne movies and earned a star on Hollywood's Walk of Fame. I am glad that Pedro ended up in show business. He deserved it. My neighbors are Mexican-American, and I enjoy spending time with the children.